You can see in his eyes how bemused he is of my asking to take his picture. To be fair it's an imposition! 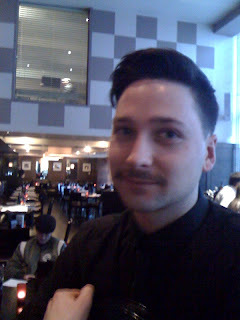 He was just serving me and my gorgeous friend Belle a ginger ale and a hot chocolate respectively when I exclaimed "ooh love your mustache"
I think you have to respect* a man who has both a quiff and a mustache!